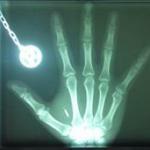 One thing that has scared me ever since I first heard of magnet implants is an MRI. Because MRIs emit such a strong magnetic field, I am worried that the magnet implant could be torn out or could move under the skin. Does anyone have any tips or experience with this sort of thing? MRI's have been discussed in the past. @ThomasEgi Ok. Thank you. That thread helped to shed light on it.